You are currently browsing Jim Stovall’s articles. The Blount County Beekeepers Association will hold its May meeting at the Maryville Church of Christ on Sherwood Drive, across the bypass from Foothills Mall. The association will return to the Blount County Library for its June meeting, but the Maryville Church of Christ will be the permanent meeting place with the July meeting. The May meeting will be on Monday, May 9, at 6:30 p.m. The featured speaker will be Clarence Collison, a well-known beekeeper and an Emeritus Professor of Entomology and Emeritus Head of the Department of Entomology and Plant Pathology at Mississippi State University, having retired from the position in 2010. Prior to assuming this position at Mississippi State University in March 1989, he was an extension entomologist at The Pennsylvania State University where he served as a beekeeping/pollination specialist and livestock entomologist. He is a contributor to Bee Culture magazine. Collison will speak on examining combs and what they tell the beekeeper and the importance of genetic diversity. The change of location for the association meeting was brought about by the rapid growth of the organization. We have nearly 150 members and have had more than 100 people attending meetings this year. The room at Maryville Church Christ is the same as the one used for the short course for new beekeepers in February. We had more than 200 people at that meeting with plenty of room for vendor stands and tables. The annual BCBA Field Day for New Beekeepers will be Saturday, April 30, at 1 p.m. at Charlie Parton’s farm. Everyone is welcome, even if you’re not a BCBA member. What to bring: Veil, protective clothing and a hive tool. Directions: From Sevierville Road/411 North off South Washington Street (Fort Craig School), go south 1.9 miles and turn left onto Brown School Road and go .3 miles to a three-way stop. Turn right onto East Brown School Road and continue approximately 1.4 miles. You’ll come to Charlie’s driveway on the right but continue past that and look for a sign at the driveway near the barn. In case of questionable weather, please call 776- 1875. Photos from the Beekeeping 101 short course for new beekeepers, Feb. 20, 2016. 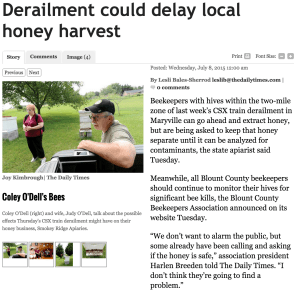 The Maryville Daily times has published a full story on the plight of the beekeepers who are in the area affected by last week’s train derailment. The story quotes BCBA members Coley O’Dell and Howard Kerr and BCBA president Harlen Breeden. Mike Studer, the state apiarist, is also quote. Beekeepers with hives within the two-mile zone of last week’s CSX train derailment in Maryville can go ahead and extract honey, but are being asked to keep that honey separate until it can be analyzed for contaminants, the state apiarist said Tuesday. Mike Studer, the state apiarist, has asked that Blount County beekeepers — particularly those in the evacuation zone of last week’s train derailment — request that CSX have honey from beehives within the zone analyzed for contaminants. That request should be made at the CSX outreach center, which is located at Heritage Middle School. Studer said beekeepers within the zone can extract the honey in their hives, but they should keep it separate from other honey they have and they should clean their equipment thoroughly after the extraction. The request to separate the honey will hold until honey from the zone can be analyzed. All Blount beekeepers should continue to monitor their hives to check for significant bee kills for at least another week. — Leave the honey on the hives. Do not extract any honey until the state has had a chance to run some tests to determine if the honey has been contaminated. — Check the front of your hives immediately to see if there are any significant bee kills that have occurred in the last 36 hours. — Continue to monitor the fronts of your hives daily. Contaminations sometimes take several days to show their effects. If you see a significant loss of bees over the next week or two, contact Mike Studer or BCBA president Harlen Breeden. Studer said that his belief is that the railroad company CSX will continue to be responsible for any damage resulting from the accident. That would include damage to beehives or honey. Studer said he hopes to have more information about possible honey contamination by sometime next week. If you see anything unusual with your hives that might be attributed to the railroad accident, you should call Harlen (865-719-1828) or Mike (615-517-4451) immediately. This is especially true about large amounts of dead bees. Their carcasses deteriorate quickly, so the sooner they can be tested, the better the results will be. The train derailment occurred early Thursday morning near the crossing on Old Mount Tabor Road and not far from Old Glory Road. A number of our members have hives close to that site. It’s the state law to have your beehives registered, so don’t neglect this important duty. If you want them inspected, below is a list of association bee inspectors. There is no cost for this service. If you are planning to move the hives, they must be inspected. The honey flow is nearly finished, and the honey supers should be coming off the hives fairly soon. Think about when you will start feeding your hives. With the flowering season over, the feeds are likely to run out of stores by August. Get ready to medicate, if you choose to do so. Some medications are temperature sensitive, so make sure you are away of how to put them on. Prepare to enter your honey in a local fair or contest. For local beekeepers, there is the Tennessee Valley Fair, the Blue Ribbon Fair and the Tennessee Beekeepers Association annual meeting, just to name three venues coming up in early fall. Order your queens now if you are going to re-queen in the fall.